Technically speaking, a notary public is a public official, licensed by the state, but in practice many tend to work in the private sector, either in business for himself or in association with a law firm or other corporation. A notary public is invested with the power to witness signatures, administer oaths and administrations, and perform other functions, such as presiding over marriages, as permitted by state law. The primary function of a notary public is to witness the execution of important documents, such as deeds, affidavits and powers of attorney. Some documents require that the party swear on oath that the information provided is accurate and that his signature is willful. The function of the notary public is to administer the oath, adding a statement to the document called a "jurat," which lists the date of the oath, the venue it was performed, and that it was duly administered. If swearing an oath is disagreeable to the signer, the notary can also perform an affirmation, accomplishing the same essential function. What Are the Benefits of Becoming a Notary Public? The criteria for becoming a notary public vary from state to state, but in most cases the applicant must at least be a resident of the state issuing the notary seal, not be a convicted felon, and not have ever been stripped of notary public responsibilities for misconduct. The application process in many states also requires a notary to be bonded against potential malpractice. This usually involves obtaining notary insurance to pay any settlements that may rise out of negligence in work. The term of a notary public is four years, though the position can be stripped. The process of application can take two to six weeks, so it is recommended that a notary resubmit his renewal and bond well in advance of the end of an existing term to prevent interruption. The date of expiration will be present on the notary's official seal. 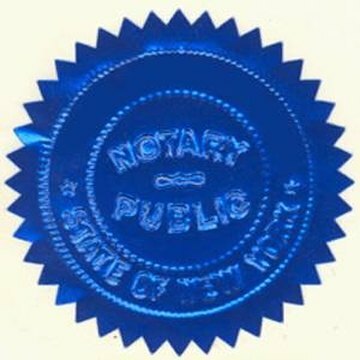 Though a notary is allowed to charge for his services, and make himself available at reasonable costs through a variety of retail outlets, most businesses or institutions that frequently require such services save time and money by covering the costs of certifying members of their staff as notaries public. Government offices, especially courthouses, will often have several notaries on staff, as will most law firms. A notary public is barred from performing certain duties, at least in the role as notary. He cannot prepare legal documents or provide legal advice. He cannot prepare immigration papers. A notary public is liable to be prosecuted criminally if he performs these functions, and for negligence if he fails to perform his duties diligently. Nicholson, Joseph. "What Is a Notary Public?" , https://legalbeagle.com/4588817-what-notary-public.html. Accessed 21 April 2019. What Proof of ID Do You Need for a Notary Public?